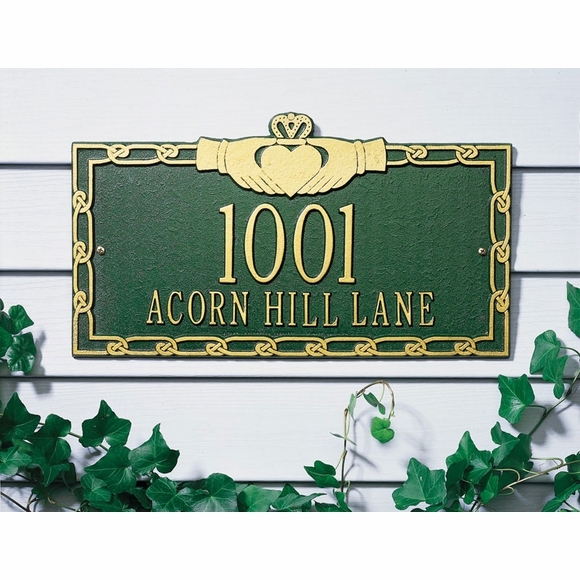 Personalized Irish Claddagh Address Plaque - - one line or two line 16.75" x 9.375" rectangle sign with a traditional Irish claddagh above the house number and a delicate chain border. The claddagh design shows two hands holding a crowned heart that symbolizes friendship, loyalty, and love. Made in USA. The one-line version holds up to five 3" characters or seventeen (17) smaller 1.75" characters. The two-line version holds up to five 3" characters on line 1 and up to seventeen (17) 1.25" characters (including spaces) on line 2. Color combinations (shown left to right in small images): GG dark green plaque with gold characters; AC antique copper; BG black plaque with gold characters; OG bronze with gold characters. Claddagh address sign with the two hands holding a crowned heart symbolizes friendship, loyalty, and love. Personalized with your address. The size and quality are just perfect! A great gift to give and Irish person! A great product! You will love it! This plaque is amazing - looks like it belongs on a historical home!